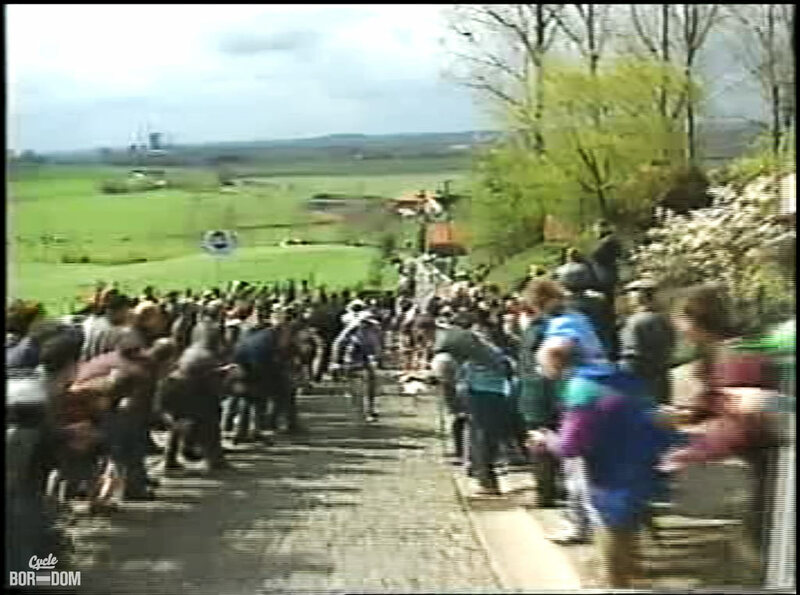 I fully admit that the 1998 Ronde Van Vlaanderan was the first Classic I watched. I’ll also admit that I watched it in 2000. Lastly, I’ll admit that its viewing medium was VHS, and the commentary was handled by Phil & Paul, complete with the “fantastic” WCP soundtrack in the background. Being a proper American, Trek-dealing, bike shop employee, I was already very familier with the ’99 TdF extravaganza. That was the beginning of my habit of watching old races repeatedly, well beyond the amount considered rational or normal. I scrutinized the atmosphere, the attacks, the style of riding, nearly everything emanating from the screen and speakers saturated my now pro-cycling starved mind. I took that 2 video set home to watch as much as the shop allowed. The rider (Museeuw) shoots by his teammate with a worthy challenger (Tchmil) stuck to his wheel. 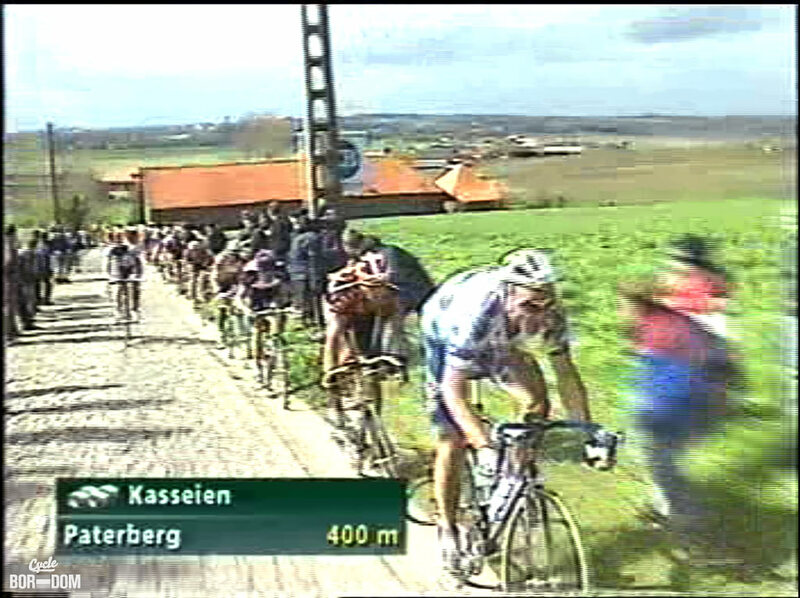 The rider (Museeuw) ferociously attacks the Paterberg via the lefthand gutter. Then it happened. The guy on the cover of the tape, the one P&P were talking about as a possible protagonist, suddenly came to the front on the hill named the Paterberg. He took to the gutter to find the easiest route, maintaining his astounding speed. That first moment of seeing high speed racing in a foot-wide gutter had a profound affect on me. This was drastically different from the manicured roads of France. The road itself was the major player in this drama. These riders had no desire to allow themselves to be punished willingly by the rough cobblestones. The desire was so strong that riding the gutter was preferred. Already breathless from the rider's attack, permanent goosebumps set in as he blasts through the crowd. What also struck me were the fans. They knew about the gutters. 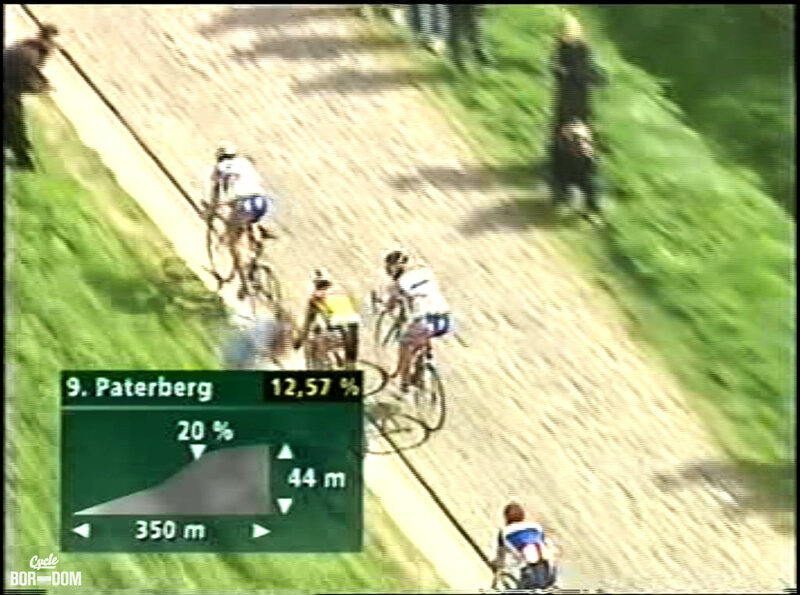 Everyone stayed out of the left side of the Paterberg because they knew that was the preferred route up the cobbled climb. Yet, halfway up there was nowhere for the spectators to stand as hedges and trees forced them into the gutters. At that point the lead rider was forced back onto the rocky road. It was also at that point where the true meaning of Flanders was gleaned. The rider’s position changed, his speed dropped, and his face screwed up into a grimace—this climb was hard. The screaming spectators were mere feet from the riders as they ground, walking pace, up the berg.